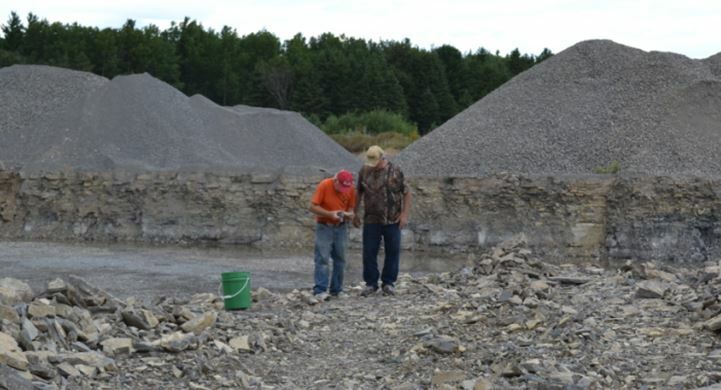 Bill Chapman shows Gary Thomas his Isotelus trilobite in Haley Quarry. The specimen is shown in the lower left of the fossil montage below. 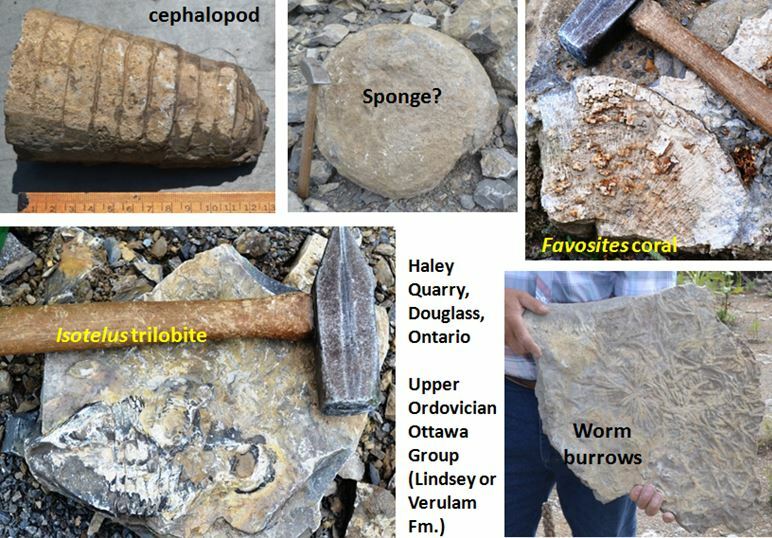 Although we found nothing comparing to the 6-8’ straight shelled cephalopods known to the region we did find several 4-6” long , 2-3” diameter specimens like the one in the upper left below. Bill Chapman even found a large Isotelus trilobite and Favosites colonies were abundant: a good afternoon of fossil hunting after the drive down from Cobalt. It was back to the Grenville and calcite-vein dike minerals on Thursday at a new favorite haunt, the Miller property 20 miles west of Eganville near Clear Lake. The owner had cleared new land since last year and we focused our attention there, digging apatite, titanite, biotite, and even some nice feldspar. 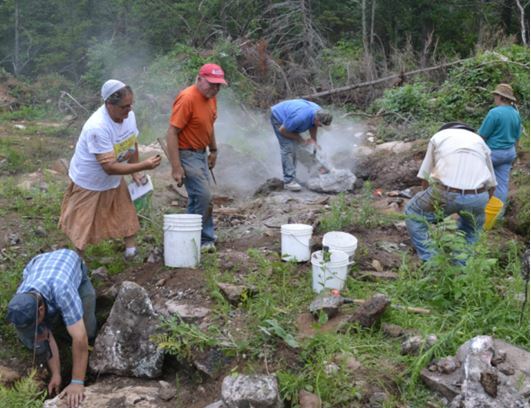 We did not, however, unearth any half-inch zircons which have been reportedly found on the new diggings on the location. But, the small amazonite pit in the woods behind the main workings had been expanded since our last visit and yielded some treasure. 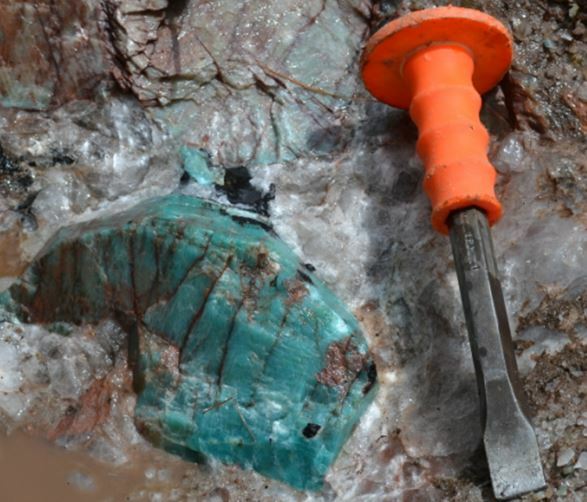 At one location the feldspar is amazonite and one 6-8” clot required some heavy digging. The surrounding quartz did not yield its treasure easily, The chisels and the chisellers got a workout, but eventually this little piece of Canada did go back to the US. 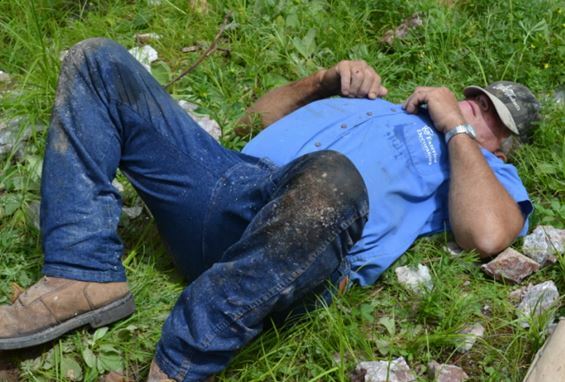 Yes, the digging of that amazonite was tiring. 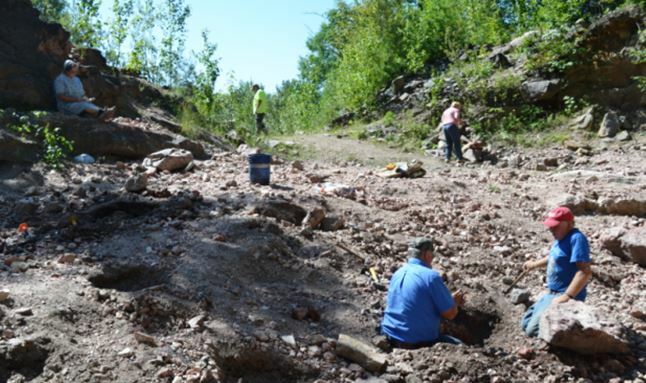 The newly cleared location was great hunting ground for loose apatite and titanite. There were also some larger slabs warranting the rock saw. No, that is not a sturgeon or salmon Linda is holding. 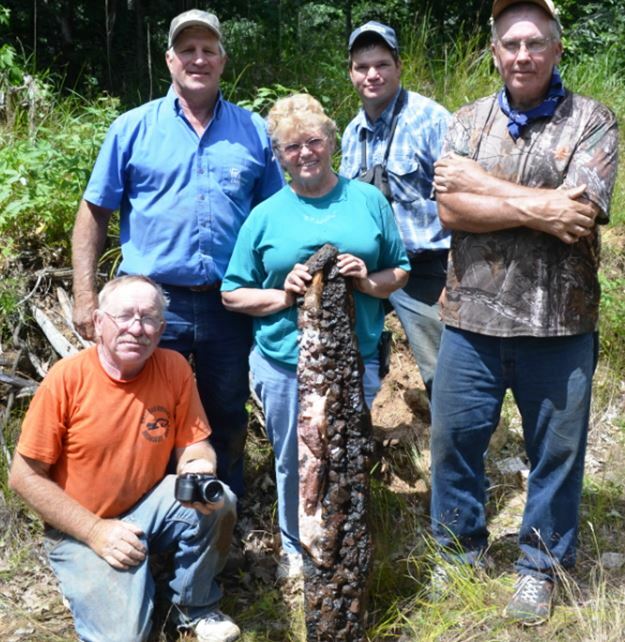 Rather these five proud rockhounds are showing off the slab extracted by all the sawing in the previous picture. Can you spot the two large apatites near Linda’s knee? Each is about 4” long and 2” in diameter and they present a nice symmetric balance to the meter tall piece featuring dark pyroxene crystals. The next stop was the Beryl Pit near Quadville. This site hosts a complex pegmatite with great mineralogical variety. Recalling our 2014 experience at the border, we tried to avoid too much radioactive euxenite and aeschynite and ended up focusing on a region of pink feldspar with large green beryl crystals in the floor of the quarry. Everyone ended up a nice piece or two from this hole, but the site also yielded tourmaline (var. schorl), cleavlandite, and even a little purple fluorite. The Beryl pit is a private pay site that is a must stop for anyone visiting the eastern end of the Bancroft district. Beryl was found by digging into the middle of the floor of the Beryl Pit. Green beryl in pink feldspar. The Canadian $2 coin (a toonie) is 28mm in diameter, just over one inch. Our final stop on the trip was much simpler from a mineralogy point of view. We visited the Burgess Mine and collected corundum. The syenite is deficient in silica (and rich in aluminum) such that corundum (simple Al2O3) forms instead of all the aluminum being consumed in silicate minerals like feldspars. Lots of steely grey crystals with slight ruby sheen to be found, the trick is to find crystalline, terminated specimen. 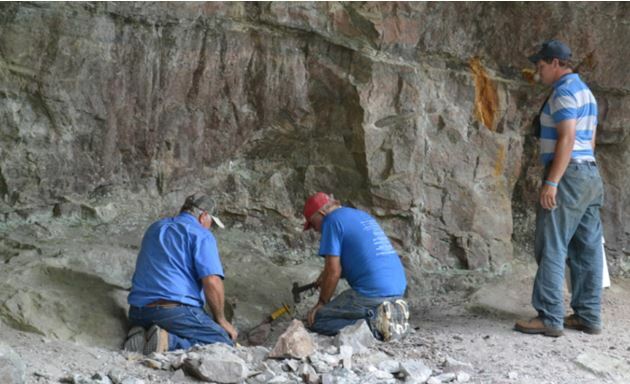 Collecting corundum in the Burgess Mine rock face. Better luck was encountered on the dumps across the road and by the small beaver dam lake.